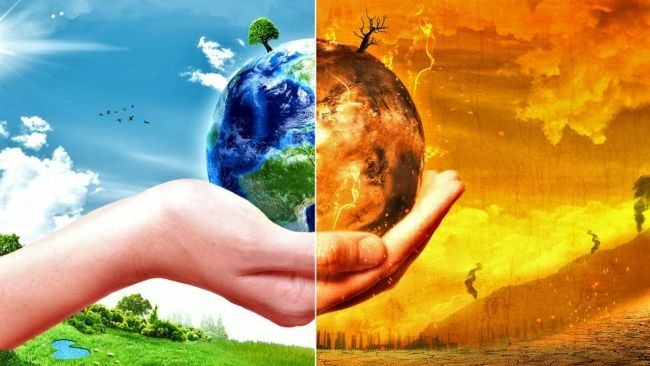 Global Warming is the elevation of temperature in an environment due to a change in the flow of heat energy from and to the closed ecosystem. This is due to the increase in the density of some gases in the air, the most important of which is carbon dioxide and methane, gases which have high atmospheric abundance causing a higher surface level of Sea by 4- 8 inches, increased evaporation, melt Arctic ice, which adversely affects plantations and human life. - Changes in the rotation of the earth around the sun, which increases the proximity of the sun and thus change in the amount of solar radiation reaching the Earth above the normal rate resulting in clear climatic changes such as high temperature and melting of snow and ice in the poles and the disruption of rainy seasons. - Volcanic eruptions and the resulting lava rush that increases the heat of the atmosphere as well as the rush of large quantities of gases and ash harmful to the atmosphere. - The increase in the release of organic pollutants into the atmosphere from factories, causing significant climatic changes. - Excessive cutting of trees and forests that reduce solar radiation and absorption of gases, especially carbon dioxide, used in plant metabolism. - Excessive use of fossil fuels and their total reliance on power generation in all its forms, which increases the amount of carbon dioxide in the atmosphere. - Air pollution due to the lack of strict control over the factories and plants that emit gases resulting from the massive manufacturing processes carried out to the atmosphere without treatment. - Desertification risk Rising temperatures make arid and semi- arid regions more drier than before. - Increased melting of snow and ice faster than in the past leading to sea level rise, which in turn leads to coastal flooding that can flood some coastal cities and states that the average sea level has risen 8 inches since 1880. - Increased risk of forest fires due to increased acute drought, which makes forests more vulnerable to fires. - extinction of some species of plants and animals face forests, farms and cities troublesome new pests and heat waves and heavy rains and floods increase in all of these factors would harm plant and animal wealth. - The destructive force of hurricanes has doubled, with studies indicating that the intensity of hurricanes has been growing since the early 1970s , especially in the North Atlantic. - Acidification of the oceans where two- thirds of the carbon dioxide in the ocean and sea water that produces carbonic acid is degraded and destroyed by a wide range of benthic and floating marine organisms such as coral reefs, sea snails and some species of fish. The spread of some epidemics and diseases because the speed of climate change is faster than the ability of some organisms to adapt. Scientists have reached a range of solutions that can reduce the impact of global warming by means of a number of means and procedures that need to be addressed in order to solve this problem, which has negative effects on the planet in full, and the most important of these solutions. - The use of renewable sources of energy to produce electricity, as well as work on the use of insulation materials for buildings to reduce the energy lost. - The use of energy saving lamps by replacing the ordinary lamps with fluorescent lamps, because these lamps can save energy equivalent to 66% of the energy that is consumed by ordinary lamps. - Minimize the use of nitrogen fertilizers by finding solutions that are effective so that the soil can be preserved by feeding them with the materials that are useful without using these harmful fertilizers. - Plant trees that have the potential to consume carbon dioxide in the atmosphere. - The need to shift from relying on non- renewable sources of energy such as oil, gas and coal to renewable or environmentally clean sources such as solar energy and hydro power. - To increase the percentage of vegetation cover, ie the cultivated areas on the surface of the earth, through the expansion of tree planting and prevent logging of forests. - Work to reduce these special emissions and wastes in factories and the result of the production processes by placing strict control on them and putting machines on the flue of those factories. Reduce dependence on private transport such as cars and increase reliance on mass transport to reduce the proportion of exhausts issued by cars and others. - Preventing urban expansion and preventing it from crawling on cultivated areas and areas. - Limit those military industries by developed countries, which have generated huge amounts of carbon dioxide. - Promoting community awareness of individuals through large media campaigns supported by international organizations to raise awareness of the seriousness of this phenomenon and its negative consequences on the planet. You have to recognize that human- made warming is very damaging to the planet and terrestrial organisms, unless you know about global warming. 1 - Global warming will cause the extinction of 1 of every 6 species on Earth. 2- August 2014 was the hottest at all. 3. The cows radiate methane more than the fuel industry, one of the giant greenhouse plants. 4. Swedish scientist Savanty Arenius is the first in history to claim that the fossil use of fuel could lead to global warming in 1896. 5. 37% of Americans think greenhouse warming is a hoax. 6. Since 1870 the sea level has risen by about 20 cm due to global warming and is expected to increase further in the future. 7- year 2010 was the hottest year ever in Earth's history. 8. There will be a 50% increase in lightning in the world in 2100 if global warming continues to increase at the same rate. 9. Global warming has caused global warming to rise to about 8 degrees Celsius since the industrial revolution. 10 - Scientists are now trying to make a thermal capture on Mars to make its temperatures suitable for life on its surface. 11. Despite global warming, we are still in the ice age. 12. Norway is the least affected by global warming, while Chad is the most vulnerable country. 13 - Global warming caused a bloody dispute resolution on an island between India and Bangladesh, the island disappeared completely due to rising water level!